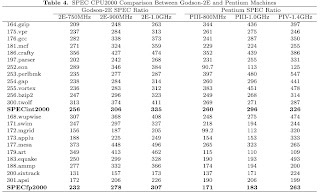 In this paper, there is a table showing the SPEC2000 score of Loongson 2E vs PentiumIII and Pentium IV. The table is provided by "overself" on Lemote BBS. Loongson 2E @ 1GHz achieved a peak score of 503 in both SPEC INT 2000 and SPEC FP2000 with ORC compiler, which is developed specially for Loongson. Very interesting. This seems to be the abstract only. If it is public, is there a link somewhere to the article (preferably in english ;-)? The article is freely available in overself's post.